Last month I ticked off an item on my bucket list: take a ride in a helicopter. I have wanted a ride in a helicopter since I first saw the 1950s TV show, The Whirlybirds. I didn’t care about the plots and stories of the series. It was of no importance to me that the main characters were usually brought in by the police. They could even have been the bad guys for all I cared. All I knew was that I wanted to fly into the sky with a huge bubble window to look out at the land below, just like the stars of The Whirlybirds. 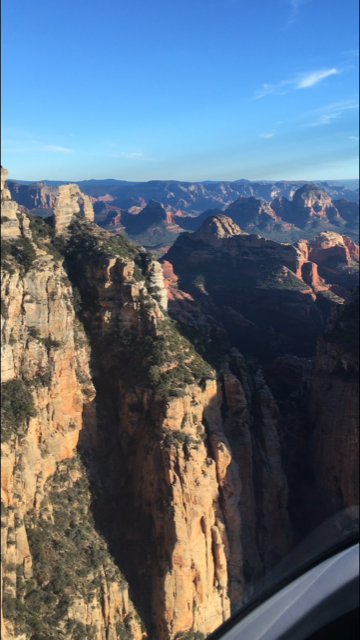 Finally, on a trip to Sedona, Arizona, where my husband and I met up with my sister and her husband for a week’s holiday, I got my wish to ride in a helicopter with Sedona Air Tours. 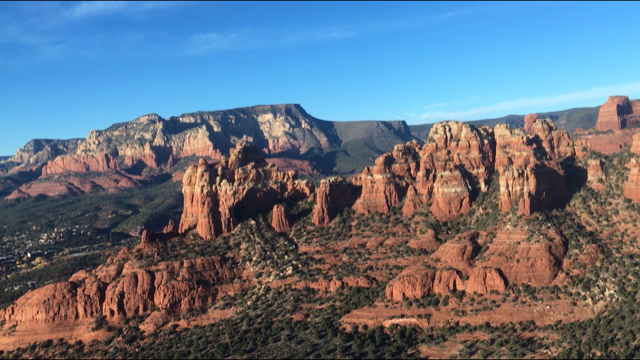 For 35 minutes we rode over the red rocks of Sedona, seeing sights that are not accessible by road and would require serious hiking and climbing skills to reach. 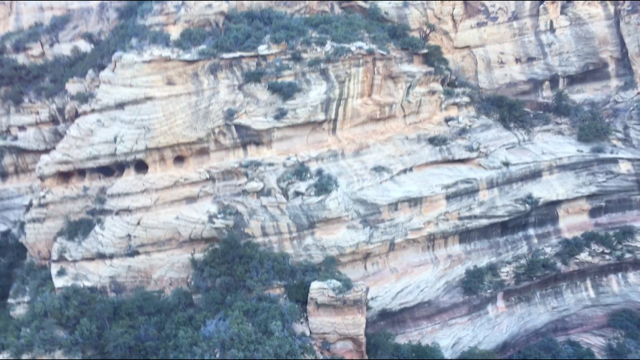 We snapped photos and recorded videos of the cliff dwellings of the former Sinagua natives as the helicopter hovered high above the trees and valleys below. At least my brother-in-law and I did. My husband sat behind me clutching the back of my seat until his knuckles turned white. He told me he didn’t want to go, but the way he said it always gave me an excuse to rationalize it away. Or at least that’s how I heard it. First, my sister wasn’t feeling well when the time came, so she decided to stay back. Let’s not go, he said. Maybe they wouldn’t fly with just three of us. Well, let’s go find out, I said. Then when a group that arrived after us was called forward to go out to the field before us, he again said he didn’t want to go. We had to wait too long, he said, implying that the company was stalling us. It was my fault, I said, because I thought the time on the note we had was our appointment time, not the time we were advised to arrive at the airport. The cost was too high, he said. 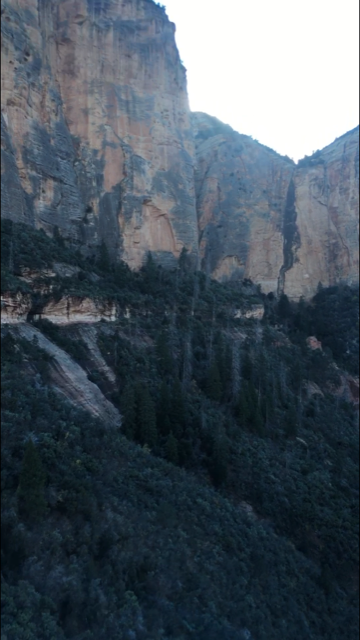 But it’s a wonderful opportunity for us to see the beauty of Sedona, I said. I had the front seat view, right next to the pilot. The second set of pedals that control the aircraft were right at my feet. (I promised not to touch them.) There was no floor there–just the pedals above air. I was thrilled. My husband wasn’t. But he survived. And for the days and weeks since then, when he tells people about our trip, he says they should definitely take the helicopter tour. The scenery is stupendous, he says. I’ll remember that if we ever end up back in Sedona. Sedona Air Tours gives a 10% discount to repeat travelers. Yesterday my grandson, James, helped me make a chocolate cake. He calls it funny cake. The recipe we used calls it wacky cake. I know it as crazy cake. The recipe we used can be found below. My dad’s sister made crazy cake for me when I was about the same age James is now. I asked her for the recipe once, but she didn’t remember the cake or making it for me. Yet it’s one of my clearest childhood memories. I remembered that the cake was chocolate and that preparing the batter involved making three holes in the dry ingredients and pouring in three different liquids, one into each of the holes. I was delighted when I found the recipe for wacky cake in a cookbook prepared in the 1950s by the ladies of First Lutheran Church of Fargo, ND. Friends we met here who went to high school in Fargo found the cookbook among items from their parents and shared the book with me because they knew it contained recipes for some Norwegian foods. Finding the wacky cake recipe in it was a bonus. I’ve since found the same recipe listed as an eggless, milkless cake, perfect for vegans. I assume the recipe came from depression days, when prices were higher than many households could afford. Or maybe from World War II when food items, among other things, were rationed. During such times, the eggless, milkless cake recipe may have been normal. But later, as the economy improved and rationing ended, the recipe would become what it is for James and me–a funny cake recipe. Having succeeded at making the chocolate wacky cake, I now wonder if I could alter the recipe for other flavors. Maybe a lemon version would work with lemon juice substituted for vinegar. I found a white cake recipe online that also calls for apple cider vinegar as an egg replacement, so I’m sure other flavors would work. Besides, even if there are easier vegan cake recipes, I’d love to discover another one I can make with my grandchildren. Mix first 5 ingredients and put into a greased and floured cake pan. Make 3 holes in the dry ingredients. In one put the vanilla, in another put the vinegar, and in the third put the oil or melted shortening. Over all pour the cold water. Mix well. Bake. I used to review books here. I don’t anymore. But when I came across The Baghdad Clock by Shahad Al Rawi, I decided I couldn’t let the opportunity to share a few of the author’s words with others. So, this isn’t a review; it’s just random thoughts about an amazing book written by a woman who still isn’t old enough to capture so much wisdom in a thin novel. I love this book. Maybe it’s because she refers to another book I love, One Hundred Years of Solitude by Gabriel Garcia Márquez. Or maybe it’s because she writes poetic thoughts in prose format that is easier for me to appreciate. Or maybe it’s the neighborhood the narrator and her friends inhabit, though different in many ways from the one I grew up in, where communities are made up of not just those who are related by blood, but by those who are connected–related in that sense–by common experiences. Just like the neighborhood I grew up in. But mostly I think it is because I am in awe of her ability to share profound thoughts from the point of view of such a young woman. The Baghdad Clock, not surprisingly, is set in Baghdad where the protagonist, a young Iraqi girl, meets Nadia, her best friend, when their families take shelter together during the 1991 Gulf War. But it isn’t a story about the war. It isn’t even about the shelter where they met. It’s the story of childhood friendships and first loves, of becoming adults and of loss: the loss of childhood innocence on one level and the loss of memories through the obliteration of neighborhoods on another. The author was born in 1986. She wasn’t even as old as her protagonist when the 1991 Gulf War broke out. The book was published in 2016 when she was only 30. How could she have become so wise in fewer than 30 years? Let me share why I think she is wise. You and Nadia do not love each other just for the sake of the deep friendship between you. You love your memories, too. Both of you, but especially you, are afraid for these memories, because their passing means ripping up the solid ground under your feet. For those who fear the future, the past is a merciful cave in which people seek shelter when they turn away from the cruelty of the present. How could someone so young have learned so much in so little time? Listen, my dear. I know you want to say, ‘Were it not for the war and the sanctions, things would have been better for us.’ That might be true, if we were to ignore geography and history. For you are a victim of geography in the first place. Your country isn’t on the Mediterranean where it might breathe the sea air, nor is it in the desert, where it might live on the luxury brought by oil. You live between them, where the bright light of the sun shines down on you all year round . . . Geography is a fate that cannot be escaped, but history is made. Adapt to your geography and change your history . . . [w]eave from its cloth a new garment. Gather the good islands together and leave out the painful ones. There, make a fresh memory, a good space for joy. In short, change the entire culture. Or at least some of it. When I read this section, I couldn’t help but think of how it describes the incivility that continues to creep into our lives, especially in social media. The soothsayer explains that those who fear the future turn to the past and see efforts to recreate it as desirable. Yet the soothsayer’s advice is that we need to adapt and change. What brings fear to some is the solution to others. The result–conflict. In our neighbourhood, we would describe the best people as being ‘good and shamefaced,’ and whenever I came across someone who did not feel a sense of shame, I would secretly think he was dangerous and wicked. Shame is not a religious or pedagogic quality, nor is it moral principle. It is rather one of the gifts of existence that prevents us from committing travesties against the rights of other people. I love this passage because it reminds me of one of the differences between the center of the moral compasses carried in life by Westerners compared to Easterners. As an oversimplification, I repeat what I heard when I first moved to Iran more then 40 years ago: behavior in the West is guilt-based; in the East it is shame-based. We, in the West, think of guilt as something to be avoided, something we don’t ever want to feel. Elsewhere in the world, shame is to be avoided, something others don’t want to feel. If I substitute the word “guilt” for “shame” in the above passage, most of us might object to the thought that the best people are “good and guilty.” But if we thought of feeling guilty as a gift, as the narrator describes shame to be, we might all be a bit more compassionate towards one another. It would still be better not to be guilty, just as it is better not to be shameful, but feeling the weight of either guilt or shame should lead us to better behavior. Every time I open the book to a random page, I find something I want to share. Instead, I encourage others to read the book.